1. Navigate to the GetResponse website (https://app.getresponse.com/login) and Login to your GetResponse account by entering your Username and Password and then click the "Log in" button. 2. Click on the "My account" tab in the upper-right corner and then select "Integrations & API" from the drop-down menu. 3. Click on the "API" section in the left-hand menu, and then click the "Copy" button to the right of the API Key field. 4. Open the OCU app within your Shopify store. Click the "Settings" button from the left-side navigation menu then click "CRMs". 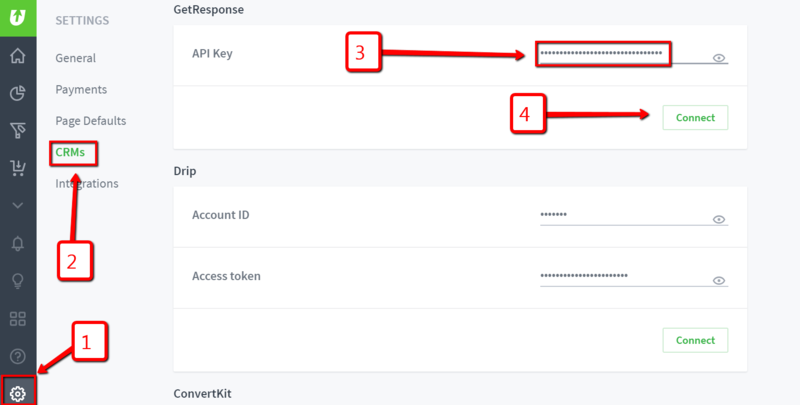 Paste the API Key into the "API Key" field and then click the green "Connect" button. Your GetResponse account is now connected to your OCU app via API! 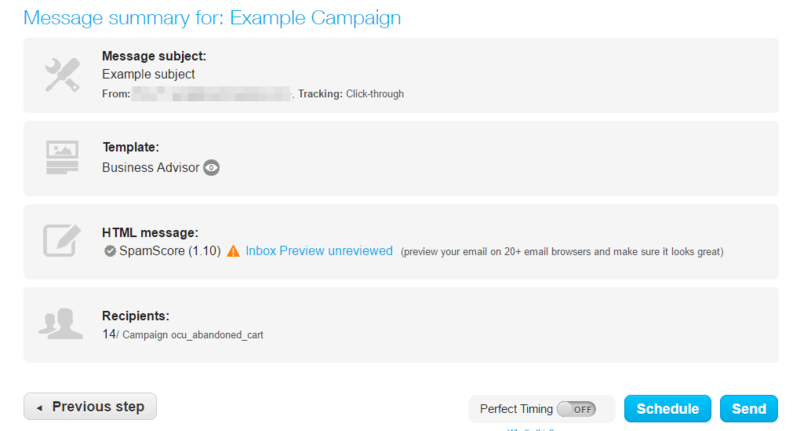 In order to have emails added directly into your campaign(s) in GetResponse you'll need to disable double-optin for your list(s) and campaign(s). GetResponse has a double opt-in process by default which means that contacts won't show up visibly on your campaigns in GetResponse until the customer has clicked a 'Confirm Subscription' button in an email they receive from GetResponse. It is only possible to disable the double opt-in process by emailing GetResponse customer support and requesting it. This is needed in order to skip the sending of confirmation emails to the email addresses that are added into this campaign. Skipping this step will require customers to confirm their opt-in through an email before their emails are added to your campaign. 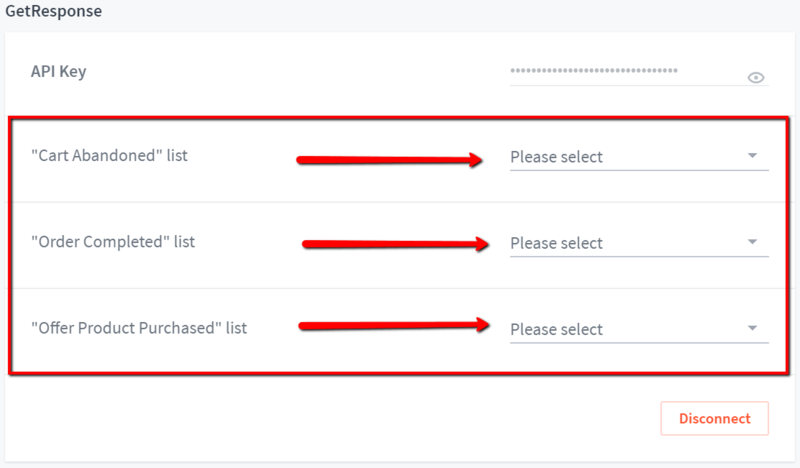 Select the desired list(s) from the fields titled “Cart Abandoned” list, “Order Completed” list and/or "Offer Product Purchased" list by clicking on the drop-down menu and selecting the list. 1. Select "Email marketing" and then click "Create Newsletter". Drag-and-Drop Email Editor which allows you to create a template in a very convenient constructor mode. HTML Source Editor is a solution for skilled users who know how to work with HTML code. We recommend the Drag-and-Drop Email Editor for the majority of cases unless you need to create something unique and you have the required skills. 3. On the Newsletter settings step, choose the Linked list, add a Message name, provide the Subject and the From e-mail address. In the Distribution Settings, choose if you want to be able to check and track the click rates on any links that you may have. You can also publish and share this newsletter on your Facebook and Twitter accounts. When you are finished click on the Next step button. 4. On the Template step, you can browse and choose a template for the e-mail or select Start from scratch and create your own template. Using completed templates are a much simpler choice. You can customize it, add, edit, replace or delete blocks using the constructor. Select your template and make changes that you want using the tools in the right-side menu. Then you need to add custom fields from the customers list into the template. Place the cursor into the position where you want to have the value displayed from the custom field and click on the Personalize button. Then select the desired field from the drop-down list. Field titles are the same as they appear in the customers list. Each field's value can be inserted into HTML tag(s) to apply some additional properties if desired. If you want to wrap the field's value into HTML tags you can go to the HTML Editor by clicking the link at the bottom of the page. Then find the desired place and add the HTML code you want. When working in the HTML Editor don't forget to follow the required format for fields variables: [[field_name]]. STRING_EQ function compares the field's value with the specified condition and allows it to output content blocks based on the result it returns (true/false). 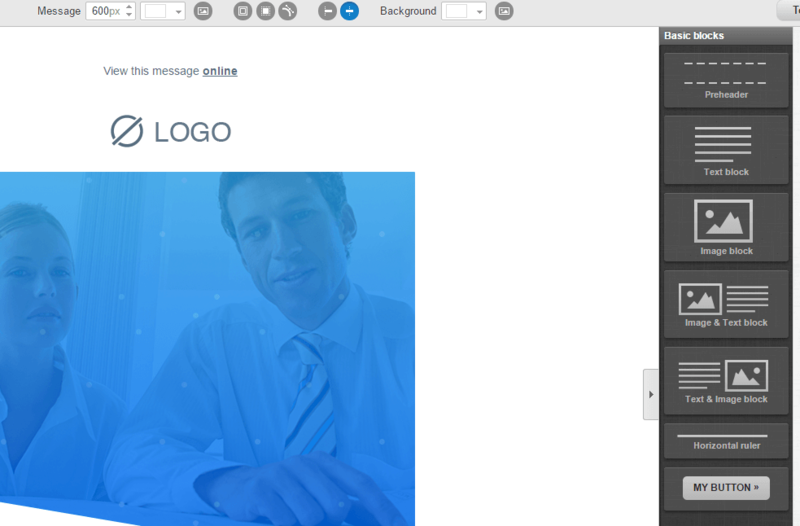 The Editor gives you the option to preview the created template and even send out a test email to see how it works/looks. When you're finished, click Next in the progress bar. 6. On the Recipients step, select list(s) of customers who you would like to receive this message. You can also exclude recipients if desired. When you've done that, above will display the count of subscribers. You can click on the Select contact manually link and in the pop-up select particular customers who you would like to receive this message. When you're finished, click Next Step. 7. On the next screen, you can see a summary of your newsletter and can change items fast by clicking on the edit link. If you're happy with all of the settings, you can decide if you want to send a message right now and it will immediately be delivered or it can be scheduled and you'll set up a specific date and time for the message to be delivered.